Let's make October less coat and more float, as you dive into a world of private pools and inflatables! It might be the month where the nights draw in and we all start to miss those balmy summer days, but there's an ideal way to keep those summer dreams going – an October villa holiday. The sun is still shining in destinations across Europe and beyond, so warming up this autumn is easier than you might think! Here's our guide to where's hot in October. 26°C in October!? This isn't Autumn, Turkey's still basking in summer temperatures – so expect an October getaway packed with beach trips. The Dalaman Region is well known for golden sands and electric blue seas and there's nowhere better for this than Oludeniz. Where the curving horn of sand comes incredibly close to meeting verdant mountains that jut out into the sea. All that separates them is a stunning slither of the Blue Lagoon. Crystal clear in places, a deep dark blue in others – prepare to be mesmerised! If you're feeling active and adventurous, why not kayak along the surface or paraglide above for a bird's eye view? With the summer rush over, expect to have a little extra space on the sand and more peace to take in your beautiful surroundings. 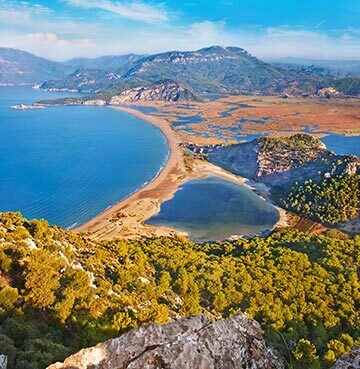 With the sun beaming down from above, a trip to explore Dalaman's fascinating history is made even more magical. Dive deep into the area's past with a trip to Kaunos, where ancient ruins date back to the 9th century. A theatre that still seems impressive enough to hold top notch performances and the Roman baths are the undisputed highlights. 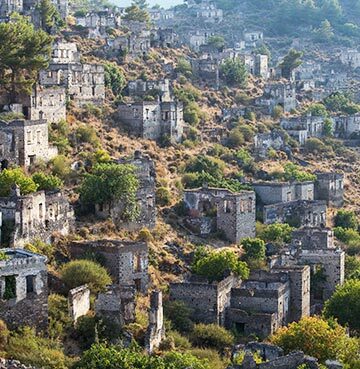 Abandoned in the 1920s, the village of Kayakoy offers a more modern take on Turkish storytelling! A political exchange of population with neighbouring Greece left it almost instantly deserted, with its churches and houses a snapshot of Turkish life frozen in time. For the oldest delight of all, head to the 4th century Lycian Rock Tombs, where eternal resting places are carefully carved into the face of a mountain. The facades of several entrances are decorated with intricate details, so make sure you grab a closer look. With the weather sitting at a toasty October average of 22°C (and high temperatures creeping further up the thermometer), there's only one place to be! Grab your towel and suncream, slip on your flip flops and grab that swimwear – we're heading for the beach. 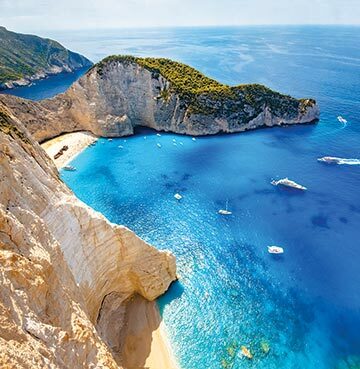 Zakynthos' coastline is like a dot to dot of quiet coves, long golden sands and breathtaking nature. There really is a beach for every taste on this idyllic Greek island! Navagio is the most famous, also known as Smuggler's Cove or Shipwreck Beach, but you really won't mind being marooned here. The vessel that ran aground in 1980 is a rusty work of art, against its brilliantly white backdrop of limestone cliffs. 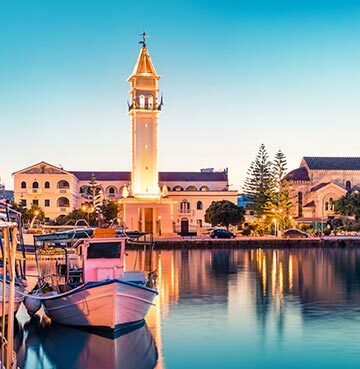 It's not all beach hopping, so for a refreshing helping of island culture head for the capital – handily also called Zakynthos. Much of the city was rebuilt after an earthquake in 1953, giving a lick of paint to its reconstructed famous monuments. The Byzantine and Venetian empires both called the island home at one point, so keep your eyes peeled for signs of both as you roam around. Among the arch windows and elegant facades of Solomos Square you'll find a museum filled with Byzantine relics. While Aghios Markos Square is home to the Tree of Freedom, planted in 1797 to mark independence from those ruling Venetians. Above the city sits the town of Bochali, perched atop a hill and home to a constant reminder of those Italian invaders. The Venetian castle offers sea views, relics of a life spent protecting Zakynthos and plenty of small churches. Although you won't have to head for the hills to enjoy these wonderful religious monuments, as there's churches dotted all across the island. Aghios Nikoloas offers a Byzantine belfry, while Aghios Markos' bell tower is an exact copy of the one found at St. Mark's Basilica in Venice. And if you just love that craggy beacon climbing towards the sky, why not tackle it for yourself? 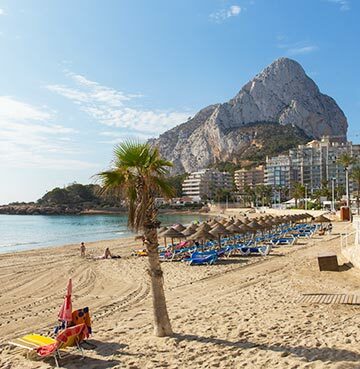 Penon de Ifach towers above Calpe at 332m and offers stunning views over the beaches, towns and sea below. A hike to the top won't leave you breathless, but the views certainly will! October's the ideal month to get active too, so there's no excuses not to explore these scenic sights and natural delights. 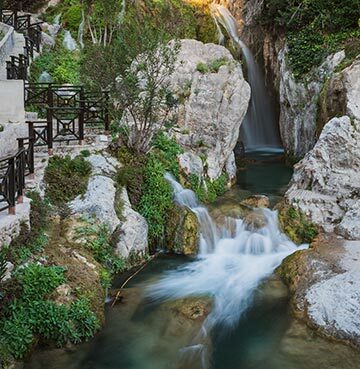 The Algar Waterfalls are a must! With weather balmy enough for you to hop in and cool off, but not too balmy that you can enjoy a stroll exploring the rivers and springs. Known locally to have health improving powers, you might emerge with a spring in your step too. Put this to good use and head for the summit of Serra Gelada – Ice Mountain. More than 400m above sea level, the two hour hike to the top is worth every step! Endless blue sea stands before you, with mountainous coastal beauty on either – drink in all that fresh air and Costa Blanca scenery. With the sun beaming down, it might be time to break out a mental sweat too? Add a splash of culture, learn a little about Costa Blanca's history and enjoy one of the hottest places to visit in October as you go. Alicante's fort dates all the way back to the 9th century, looking over the city from its enviable hilltop position. So even if you're not big on history, just admire those stunning views that stretch over the Marina and out to sea. Denia's home to a castle of its own, with an eclectic mix of architecture that details its fascinating past. While Javea's 15th century fortress gives you a hefty helping of Gothic brilliance, made even more charming by the traditional village houses that it's nestled nicely within.